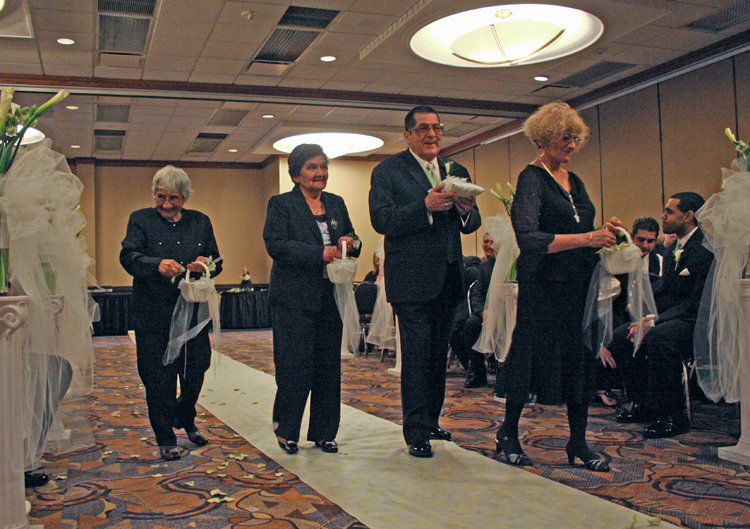 One ringbearer and three flowergirls walk down the aisle at the Radisson in Merrillville, In. Aren't they adorable! And these grandparents (maybe great grandparents?) stole the show. Let's be honest, there's just not a lot of difference between '8' and '80." Just a zero; and what's a zero among friends? Some ring bearers and flower girls happen to be eight; these just happen to be in their eighties. The only difference is that little zero. No big deal at all !! Think of the experience they'll bring! Think of how happy they'll be that you thought of them, and invited them to actually participate in your wedding. Think of the light hearted laughter they'll bring the start of your ceremony.